If fine-dining is your style, also check out these 6 Must-Try Indian Fine Dining Restaurants in Delhi. Got cash to splash? Bukhara has a string of awards to its name, including being voted "Best Indian Restaurant in the World" and "Best Restaurant in Asia." 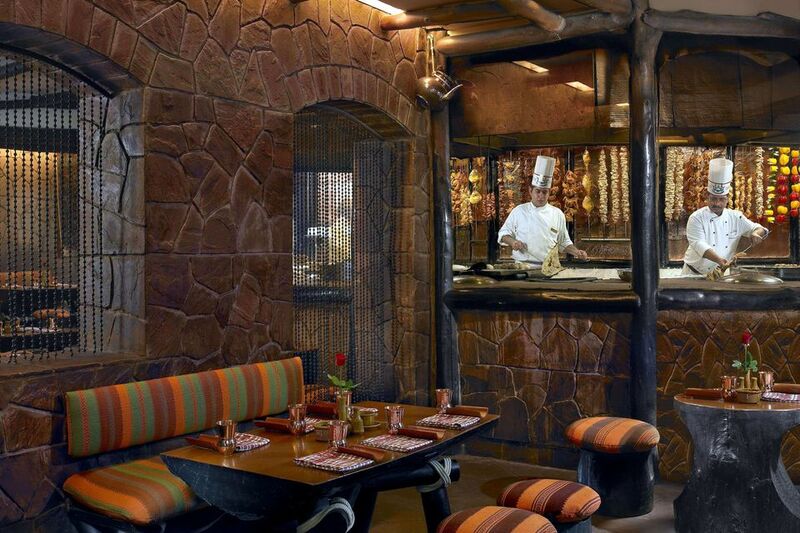 Located at the luxury ITC Maurya Sheraton hotel, this restaurant is renowned for its rustic atmosphere, open kitchen, succulent kebabs, and massive naan bread. The Dal Bukhara (black lentils simmered overnight with tomatoes, ginger, and garlic) has achieved legendary status. Kebab lovers will also appreciate the Burrah Kabab and Murgh Malai Kebab. Expect to pay around 5,00 rupees for two people, and be sure to book a table well in advance. Perfect for romance, Veda is one restaurant that will really grab your attention. The interiors were crafted by Rohit Bal, a lauded Indian fashion designer, and everything flickers and shimmers. Candles, mirrors, chandeliers, and an embellished glass dome are set against a backdrop of deep red velvet curtains and exposed brickwork. The menu features Indian cuisine with a contemporary twist, and there's a special tasting menu that has small portions of a selection of items. The restaurant has an impressive wine list too. Expect to pay about 1,600 rupees for two people. For a sweeping 360-degree bird's eye view of the city, dine at India's highest revolving restaurant (and the only one in the Delhi), 240-feet up on the 24th floor. You'll be able to see many monuments such as the Red Fort, Jama Masjid, and Rashtrapati Bhavan. The restaurant takes 90 minutes to complete one revolution, which is about the duration of a leisurely meal. There's also a lounge bar on the 25th floor, but it remains stationary. The menu focuses on North Indian cuisine but offers Chinese and Continental as well. Food is on the pricier side because of the restaurant's uniqueness, with a meal for two costing around 2,500 rupees. Long before he founded Indian Accent, Delhi's much-acclaimed inventive Indian fine-dining restaurant, Rohit Khattar opened this restaurant at his family's Broadway Hotel to display his eclectic collection of discarded vintage household items. Chor Bizarre aims to capture the spirit of the "thieves markets" in every large Indian city (and indeed, one takes place near the hotel every Sunday). It definitely creates an interesting dining experience. To give Delhi a break from ubiquitous butter chicken, the restaurant serves cuisine from India's northern Kashmir region. Go there hungry and feast on the Wazwan, which comes with an array of dishes. The cost is about 2,000 rupees for two. To really work up an appetite, combine lunch with a guided walking tour through Old Delhi. No doubt you've heard of Butter Chicken. After all, it's on the menus of Indian restaurants worldwide. However, this restaurant is credited with actually inventing the dish! Moti Mahal was established in 1947 by three men from Peshwar, who fled to Delhi after The Partition of India. They set up a tandoor in the center of the restaurant and started churning out delicious tandoori cuisine that people couldn't get enough of. Time seems to have stood still at the restaurant, which is as old as independent India. Its decor is distinctly nostalgic and the walls are lined with awards. You'll definitely feel like you're experiencing a piece of history! Expect to pay around 1,000 rupees for two. Karim Hotel was established in its current location in 1913 and is now into its fourth generation of management. The area, near Jama Masjid in Old Delhi, provides a fascinating insight into a side of the city that many visitors don't get to see. The restaurant is simple but it serves up inexpensive Mughlai-style food, including a brain curry that will keep adventurous eaters happy. Others may prefer the chicken tikka or palak paneer. A meal for two will cost around 800 rupees. Cash only. One of the legendary restaurants of Pandara Road, Gulati has been in business since 1959, when it started out as a modest dhaba (roadside eatery). Although Pandara Road has become upmarket now, at the time it was an unremarkable neighborhood with government staff housing near India Gate. Gulati flourished providing lunch to office workers, especially after the owner perfected making butter chicken. The restaurant has a daily buffet lunch with an enticing variety of dishes. It also hosts special food festivals, such as biryani and kebab festivals. The kebabs are a highly recommended and you can order a kebab platter to get a mix of different ones. A meal for two will cost around 1,200 rupees. Vegetarians, do note that there's a veg-only Gulati restaurant next door. For some of the best channa (chole) bhatura in Delhi, head to Kwality. This restaurant claims theirs is world famous! Its been their signature dish since 1947, and they prepare it in a traditional way overnight using a secret blend of spices. Apparently, the owner got the recipe off a cook from Rawalpindi, a city in the Punjab province of Pakistan that was the original "channa capital". When Kwality opened in 1940, only ice cream and milkshakes were served. However, the restaurant soon expanded its menu, and expanded across India. A meal for two will cost around 1,000 rupees.